This versatile little filter is a beer maker's insurance policy! Whether you’re aerating or racking you will appreciate having the peace-of-mind of knowing that your brew will not be contaminated by whatever is floating around in the air. Use it anywhere you need to keep something sanitary. Both 1/4"" and 3/8"" tubing will attach to it, and it will snugly fit in any standard stopper as well. Airlock: The most common use might be as an airlock on any kind of fermenter. 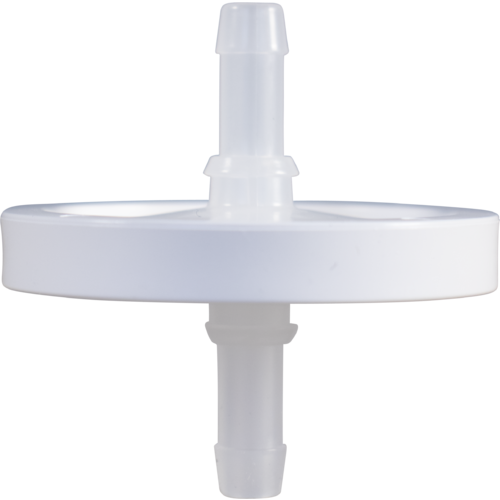 Unlike other small sanitary filters, this unit fits perfectly into a stopper. Works great for conical fermenters where air is taken in when samples are taken or trub is dumped. Using the sanitary filter as airlock also eliminates the concern of drawing air back in as hot liquid cools and contracts in a fermenter. It is not appropriate for long term storage of beer as it is not an oxygen barrier. Inline Aeration/Oxygenation Filter: With an oxygenation or aeration system, such as our FE375 or FE380, it will filter contaminants out of oxygen or air. It is connected inline between pump/O2 tank and Stainless Diffusion Stone. Hand Pumps: Some breweries use this filter with the breweries hand pump system. Air going back into the cask is sanitized through this filter. This has extended shelf life of Real Ales by up to 2 weeks! About the inline filters: There are two sides to the filter - an "in" and an "out". The direction you use doesn't matter, however, you want to take note of which way you first push air through it and always keep it that way. There is an arrow on the edge of the filter housing that we use to keep the airflow going one direction when using it. The filter should never get wet, so don't try and sanitize it by dunking it in sanitizer. If you want to clean the outside of it, use Alpet D2. To store the filter, use a little tinfoil on the "In" of the filter and store in a zip-lock bag. Can last up to 1 year. Discard if there are any signs of discoloration. This product qualifies as a HEPA filter under US government standards. To filter O2 into wort before pitching yeast. Just a replacement for my current one that I have been using for the last 2 years. To clean the air or oxygen while I aerate the wort. It's probably time to change my original filter. Sanitary but oxygen permeable barrier for my starters. Have an old one. Time to replace. What is the maximum safe pressure for this filter? Using it for CO2/N2 draft air filtration. There should be no need to filter CO2/N2 going into a keg. If you want to use it as a vent filter with a beer engine, that would be fine. I use it while preparing yeast in an erlenmeyer flask while its on a stir plate, then replace that with an air lock. The theory there is that air is drawn into the flask as it is spinning to provide oxygen for the yeast. Once they start multiplying, and give off CO2, the air lock goes on. Without an air lock, I've had the CO2 pressure blow out the cork with this filter in place once the yeast started ramping up. I used it on an oxygen airation system for wort going into fermenter. So, I really don't have an answer. ; however, I will say they don't stand up to even moderate pressure. Dose anyone know how many uses/how often this needs replaced when only used to start siphons? BEST ANSWER: This filter can last up to one year and should be discarded if there are any signs of discoloration. It is important to never get the filter wet and to store it dry at all times. A peace of mind item. Keeping the strange out of my cultures. Works great for aerating wort with an O2 cylinder. No issues after about 4 or 5 uses. I keep a few around to use on the stainless steel racking cane. I am using this to create a simple. sanitary siphon with a two-port carboy hood and a racking cane. This system greatly simplifies my setup and cleaning when racking to a secondary fermentor or bottling bucket. There are lots of other uses for this handy little filter as well. make sure that you mark with a sharpie the side that faces the pump so that you hook this up in the right direction each time. My understanding is to keep this as a sanitary filter, you have to push air the same direction each time. Also..this filter will find any moisture in your hoses so make sure they are dry before you hook up. Great filter easy to use, but make sure you have the right size hose if you are going to use this with the Whisper aquarium pump. 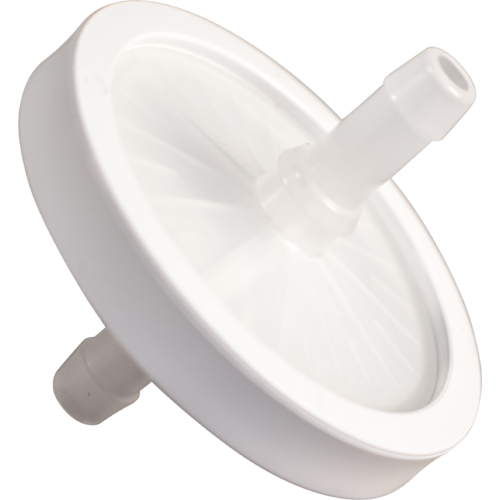 This is great to add to a two port carboy cap and create a sanitary siphon. Place a racking cane in one port and this in the other. Blow through the sanitary filter and the racking cane will start siphoning. I saw the in a BYO magazine the other day and it works great. I like it better than the auto siphon because all you have to do clean the cane, not the whole auto siphon. Simple, effective, peace of mind knowing my oxygen system is protected from any possible contamination. I use this as an adapter for both my O2 wand for oxygenation and for CO2 for sterile/closed transfer with my Better Bottles at very low pressures. Works well and easy to use. A must have for filtering and aeration. Easiest thing to help clean the o2 and or Co2 before aeration. It is such a simple peace but a must have not to mention, It's Cheap! I always keep it clean and store in a plastic bag. I use it for my siphon when I am racking. Works really well. DO NOT GET IT WET or it is game over. I keep a back up incase I have an accident. The filter works fine. I had a problem because the tubing required for the filter is larger than the tubing for most aquarium air pumps, including mine. Even with soaking the hose in hot water, I can barely fit the tubing onto the filter. This is a problem every time the tubing between the filter and stainless air stone is removed for cleaning. There are better designed filters that accommodate both smaller and larger air hose. You have to have this. I don't trust my pure o2 to be so pure from the tanks . So this is hooked up to make sure no nasties are getting in my wort.. Like the instructions say don't get it wet. I keep mine all wrapped up in a bag inline with my o2 line. Just to be safe. Wish they had other size connectors ... But it works for my setup. I've purchased several of these filters for my oxygenation system post the Blichmann Therminator. I hook this up inline from my air compressor to my oxygen stone and then to the cooler. You need one of these if you're going to oxygenate. These are pretty sturdy, the only thing is to take care not to get them wet. Fortunately it will be very obvious if you've messed up... inspect your filter every time you use it and you'll usually see tell-tale black spots on the filter if you've infected your filter with some unwanted organism. I sue this with my aquarium pump to aerate my wort and I've never had a problem with contamination. Using this really helps me to get a quick kick-off on my yeast a great attenuation. I use this in line on my aeration system works good. I use this in line with my oxygen stone. For the price, why wouldn't you add in a layer of protection? I've never truly worn one out, just simply replace from time to time. Never had an infection problem as a result! An essential part of my oxygenation system! lack of cleanliness. Using this filter I can feel good about the oxygen I'm pumping into my wort. I have gone through 2 of these so far. First one didn't work at all, no air flow. Second one barely any air. By the time you bust your lungs trying to rack a 5 gal. carboy the flow stops and the pressure flows out. You have to keep blowing or hold your finger over one end and catch your breath. There should be a simple plastic type valve inside that keeps the air from escaping. Also I've found that the orange carboy hood stretches out quite easily and leaks air after only a few uses. Very frustrating. I use this filter for oxygenation as well as doing a sterile transfer using a carboy hood and a racking cane. I've never had and issue. This was a decent product though I haven't used it much. I found a sterilized foil piece over the flask for a yeast starter to be sufficient. This is a very handy tool to have on hand. Make sure to mark what the dirty side is. Easy protection for your fermentables. The filter works well, but be careful... especially when setting it up. The first one I tried I broke off one of the barbs putting the hoses on it. I had two of these arrive broken on delivery. MoreBeer was fast and corteous w/return. They work great with the oxygenation rig they sell, but definitely are easy to break (especially when removing from the black hose going to the stone). Fit is very tight, so just be careful. This was a great product for transfers. Simply and reliable. These are great when you want "clean" air for transfers etc. I just use it on the the carboy hoody and a quick blow your are off and running. Don't risk pumping contaminants into your wort. Just put this filter in line to your diffusion stone and filter out all the bad bugs. Only filtered O2 touches my wort. Cheap piece of mind for aeration systems. Why risk contamination! Always keep a couple on hand. I use it for my MoreBeer inline oxygenator. I also use it in my airlock when rackinf form conical. This worked as designed, but I had bought a really under-powered aq pump and was not happy with the flow. This is the best item to have to filter your air before aerating your wort, been using this for over a year now without issue. I have broken 3 of these trying to remove them from tubing, but if I leave them alone, they work just fine. I've used them for carboy transfers, aeration and for letting starters breathe clean air. and protect your wort from nasties in the air. Works great, had no problems. this worked great on my wiser pump to keep oxygenate the wort.